Apply for T-REX 500 . 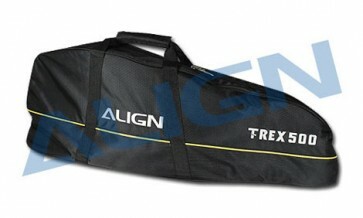 Carry bag designed specifically for T-Rex 500, utilizing superior grade water resistant canvas. External lining contains anti-vibration and impact resistant protection foams, with extra thick padded base, providing excellent protection for helicopter. 1.Collapse the main blades and fix them to the tailboom using blade holder. 2.For helicopters with flybar, loosen the flybar retaining setscrews, and slide the flybar rearwards. Slightly tighten the setscrews and let the flybar rest on top of the main blades. 3.First position the head of helicopter into the carrying bag and adjust to proper position, then position the transmitter and battery pouch inside the bag. Finally load the tool pouch into the bag and zip up the zipper. To ensure safety during transport, please make sure helicopter and radio is turned off before storing in bag.